The image on the left is a scan of Kaar newspaper from the 1980s. Kaar was the weekly publication of the Fedayeen, the Marxist-Leninist guerrilla group which started the armed uprising against the Shah from a town in North Iran, called Siahkal. The headline says "Fedayeen (Majority), More Resolute than Ever, Under the Leadership of Imam Khomeini, Battle Decisively Against the Criminal America. This is Our Hard Punch in the Mouth of Imperialism's Lackeys"
After the revolution, the organisation split into two, mimicking the Russian Communists, one group called itself Fedayeen Majority (Bolsheviks). The other group never referred to itself as Fedayeen Minority (Mensheviks), for obvious reasons, but the name stuck with them. The Fedayeen Minority stuck to their founding principles, but the Fedayeen Majority, influenced by the Soviet backed Tudeh Party infiltrations into their organisation, chose a more conciliatory approach with Ayatollah Khomeini and the hardliner religious elements. Their justification was that Iran's main "enemy" was none other than, the American imperialism. They had found a quote from Lenin, which said "petti-bourgeoise was the natural ally of the proletariat". 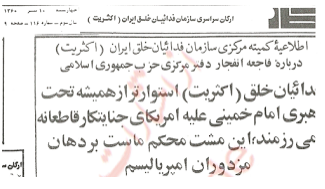 Unable to fully understand the true nature of the Islamic Republic, the Fedayeen Majority, classified the clerics as petty-bourgeoise and concluded that they were the natural ally of the proletariat in the war against US imperialism. A naive and childish interpretation of the world, which is sadly all too familiar with many leftist organisations in the West today, like the SWP or whats left of it. Since the split, the Fedayeen (Majority) did everything they could to get into bed with the hardline clerics. They even went as far as turning into informants for the regime and informing on their former comrades. Needless to say all this cuddling up and performing mating rituals got the Fedayeen (majority) to nowhere. Once the Islamists had finished with everyone else, they came for the Iranian Fedayeen "Bolshevik" pretenders too, and completely annihilated them.